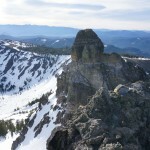 Castle is a trio of cool conglomerate bumps on a ridge near Donner Pass; Lola is a brushy slag-heap about 4 miles farther north. 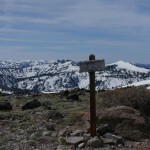 Doing them together from Donner Pass is a reasonable day after the lower-elevation snow has melted, as one can return via the PCT; in slush season it’s a bit more of a slog. I left from the gate at Donner Pass around 6 AM, turning right at the first branch in the jeep road and crossing a very cold-looking creek. 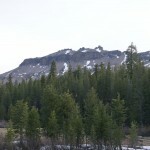 I followed bits of the road and bare ground up the southwest-facing slope toward where I thought Castle Peak might be, eventually emerging from the trees on the southern end of the peak’s broad base. 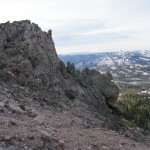 After scrabbling up the steep but not too loose slope to the plateau, I had some fun doing a bit of gratuitous 3rd class on the knobby, solid conglomerate rock on the way to the summit. 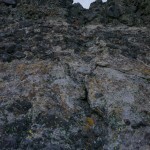 The summit itself is reached by a short, near-vertical pitch that remains easy 3rd class thanks to ample holds. I found a benchmark, but tagged the next bump over anyways, which looked just about as high. Thus ended the fun part of the day. 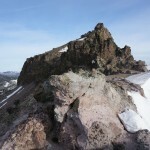 From there, I followed a use trail north along the ridge to Basin Peak, shielding my left eyeball from the chilly wind. 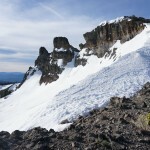 From Basin, I made my way toward Paradise Lake, glissading down some steep slush, then climbed over the nameless peak southeast of White Rock Lake before picking up an old trail leading up Lola. Fortunately Lola is popular enough to sport a large windbreak, because the wind had picked up. 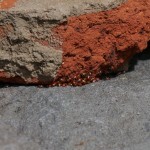 I huddled in the shelter for a snack, keeping a wary eye on the repulsive clusters of ladybugs, then set out on the return. The plan was to drop to White Rock Lake and pick up the PCT, which I hoped would be partly snow-free at its lower elevation. Near the lake, a 3-foot snake and I startled each other. 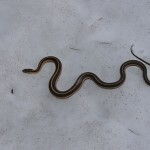 As I got out my camera, the poor reptile slithered onto the snow, which can’t be pleasant for a cold-blooded creature. After taking a few pictures, I was going to catch him and put him back on dry ground, but he slid into a cold hole next to a tree trunk, from which he would be difficult to extract. I hope he was okay. 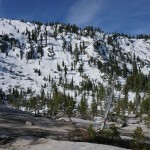 I found the PCT, and while the bare parts were nice, the snow in the trees was unpleasant slush. 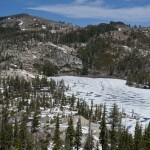 I lost the trail, and eventually found myself near Paradise Lake, from which I reclimbed Basin and followed the normal trail — where I could find it — back to Donner Pass. I passed a few groups along the way; evidently Castle is a popular scramble, even in wretched late-spring slush.